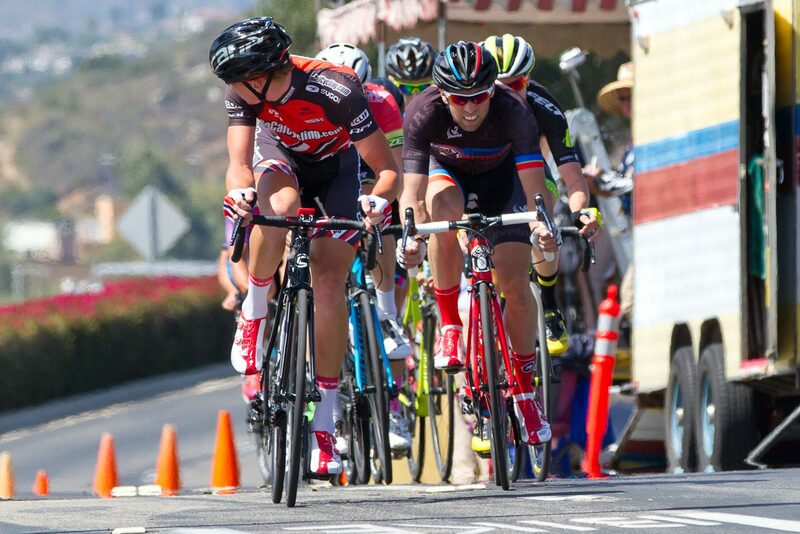 The Pro 1/2 field at the San Marcos Criterium started off with around 50 riders for the day. The course was a decent size lap with 5 corners and a nice headwind climb. The race conditions were good on the day but the wind played a big factor for some solid racing. The SoCalCycling.com Team only had two riders represented on the day with Quinten Kirby and Wesley Eslick. Early on during the race there was a solid spilt of eight riders that got themselves off the front of the group with all the major teams showing themselves in the move. Around five laps into the race a breakaway of five riders established themselves off the front with a 15 second gap. Shortly after Quinten Kirby and a Stone House Group pb Pro Bike rider put in a solid move on the climb towards the finish to get across to the breakaway up the road. Around 2 laps later the two riders in the middle managed to get themselves across to make it a breakaway of seven riders. Back in the field there wasn’t much work being done to try bring the break back other than Monster Media putting a few of their guys up there. A few times up the climb on the course riders were attacking to try get another small group off the front of the field but nothing was to stick. The race came down to the final seven riders in the front with the Stone House Group pb Pro Bike team having 3 guys up there. It made it hard for the other riders to follow all of the attacks. Going onto 1 lap to go one of the breakaway riders got himself off the front of the break and managed to hold onto a solid lead which would get him the win with Jon Hornbeck (Holowesko-Citadel) taking 2nd and Wolfgang Brandl (Centric Bikes) in 3rd. Quinten Kirby (SoCalCycling.com Team) pulled off a solid result finishing 5th after pulling in an impressive move to get across to the lead group.